The Chateau Hathorn Wine List has over 12,000 bottles of wine and won some of the best awards that a wine cellar can achieve. The Wines vary from French Bordeaux’s and Burgundy’s to California’s vineyards of Napa Valley, Sonoma and more. The list continues to wines from Italy, Switzerland, Portugal and Germany. We also carry exclusive Dessert Wines. The Cellar offers the ultimate in intimate dining. Contact us to discuss the your options for fine dining in our hand dug Wine Cellar. 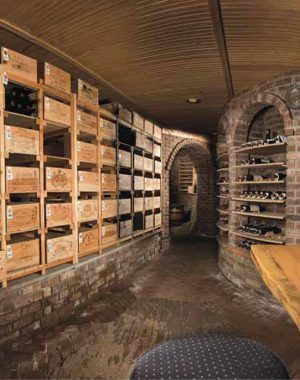 Click Here to read Orange Magazine’s special feature on Chateau Hathorn’s Wine Cellar. 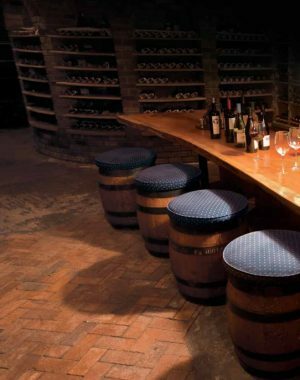 Gourmet Dinners in the Wine Cellar must meet the minimum of 8 people up to 18 people maximum. Smaller parties will be considered with a additional room fee. The Cellar offers the ultimate in intimate dining. Most likely the Chateau’s best kept secret, the Wine Cellar remains out of sight at the base of a stone staircase. The Wine Cellar was a hand dug addition by Dolph Zueger. Small exclusive parties can savor a sensory experiences of sight, taste and aroma during a privately served gourmet/wine tasting meal.